Now here's a "total solar eclipse" of an even rarer kind. Hope it comes as an Ultra-Surprise to even the most sophisticated of you. During this astronomical event the object blocking out a stellar disk was not our moon, but the planet, Mars. And the stellar disk in this case was not our own local star, "Sol", but the third magnitude Epsilon Geminorum. It's in the right twin's "leg or body", a bit lower than midway, in the constellation, Gemini (which is shown rotated CCW to the left by about 45 degrees above). This is a noticeable constellation above and to the left of Orion, as seen from the Northern Hemisphere, and contains the sister twin stars, Castor and Pollux. You can see Gemini in the stellar view at the top of this page. 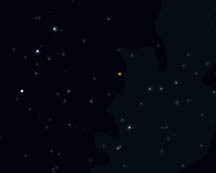 The twin stars are the bluish-gray pair towards the upper left, which form the top of the constellation, the "heads" of the twins, in many visualizations. The slightly yellower "star" somewhat below them is actually the planet, Saturn. The next brightest object is the reddish-orange speck just above and to the right of center, the planet Mars. It was nearly full (90%) on that date, with a quite small diameter of 6.4" of arc (at its closest Mars can measure nearly four times that size). The date for this configuration? Some years ago, in the Spring of 1976. The exact date was April 7th, and a headline from a decaying clipping (I somehow saved) from the New York Times for that day is shown above. You might enjoy reading the whole clipping, here (or just click the headline image above; note the entire contents of the clipping are ©1976, The New York Times). This event seemed to sneak up on the astronomy professionals. Perhaps they were being cautious. Sky & Telescope magazine mentioned it in their March 1976 issue, rather shortly before the occultation (for that's what such events are called), not providing us with their usual long lead time. Occultation is a more general term than "eclipse"; it's usually applied to the passage of the Moon in front of some star or planet. (FYI: yes, a total solar eclipse is really "just" an occultation of the sun by the moon.) 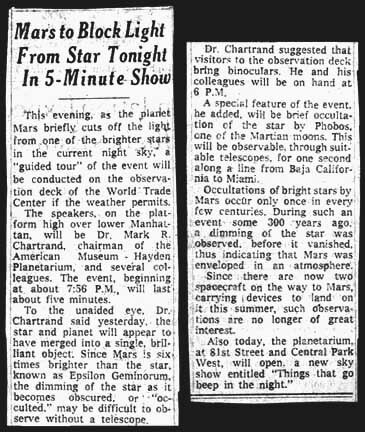 The calculations here were critical (Mars' orbit was not so well known until later, via space probes), so early predictions about this occurrence would have suffered a lot in accuracy. As it happened I was living on the upper West Side of Manhattan at the time, and had very recently acquired a used Celestron 14" telescope at a very good price. There aren't many opportunities you encounter to use such a big instrument from the big city -- this would be a dandy opportunity! As the path you see above was finally calculated, NYC would be only a little north of the central line of the path (just like for a solar eclipse, a good place to be is right on the centerline!). This would be a neat astronomical event to witness, and perhaps to photograph. With the help of a good, curious friend, we managed with effort to lug the sections of the C-14 up onto the roof of the building, and put them together while it was still light out. The image shook when we walked about, but if we were really still it was just fine. 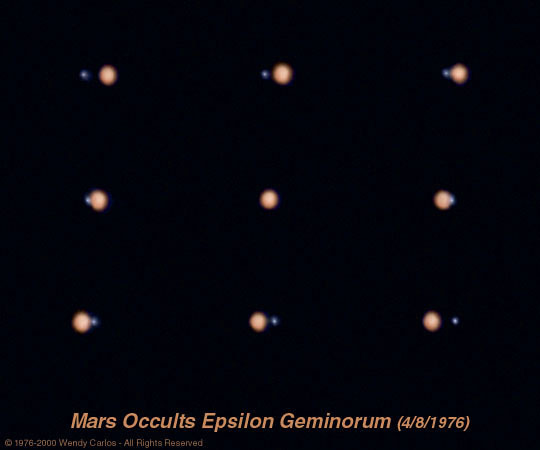 Mars appeared visually as a reddish-orangey globe (it was not particularly near Earth at this time), very different to observe than a star. Even the nearest star in a telescope presents but a small speck bright of light, a "fuzzy point". No stellar disk can be seen from Earth (except our Sun), even using high magnification. Epsilon Geminorum is a 3.5 magnitude star, not one of the brightest, even a bit on the dim side for NYC's light-polluted skies (we've gotten a LOT better in the decades since 1976, with special light-safe street lighting, and other methods). But April seventh turned out luckily to be a lovely mild, cloudless early Spring evening (the critical five minutes were centered on 8 PM EST, by which time it was definitely night, a magical night for some of us). I also attached my faithful Topcon RE (you'll see my drawing of it on top of our Photos Page) to the telescope. I have a special right-angle magnifying viewfinder Topcon made for it (huge sharp and ultra bright images -- try that with any recent camera), and a special telescope focussing screen (aerial image, no omnipresent matte groundglass, which impairs viewing), that were designed just for highly-magnified images like this. I tried using "eyepiece projection," a well-known technique that produces a fairly large planet size in photography -- otherwise you get just a teensy disk on film. On a final tech note, I made the exposures on an unusual new Kodak film made with microfine grain. Many of the 36 images were a bit blurred by our excited pacing around the roof as the once in a lifetime event proceeded. But half of them are just fine. Here is one of the pre-total images above. Click it for the complete nine-image sequence, assembled as a 3 by 3 composite. The progress over time is as you read: left to right, then down. The central image was taken at the middle of "total eclipse", so no star can be seen. You can see above that Mars' orange globe is about to pass directly over the small bluegray star to its left, which was about one-ninth as bright as Mars at the time. There was some scintillation (atmospheric disturbance), so the star is not quite as tiny and sharp as usual. The planet moved in its usual right to left (West to East) direction, this being the Northern Hemisphere. The whole sequence shown lasted less than a half hour; these nine images are symmetrically spaced over time. The total duration of the "eclipse" of the star was about 5 minutes. And the interesting portions of just covering, or just uncovering the star (the 4th and 6th images) lasted but a matter of several seconds apiece. The planet Mars is so noticably reddish when seen through a telescope that it tends to make nearby stars take on a complementary hue, a contrast effect of the eye and brain. The sky appears mostly dark and without much tint, so it provides little clue as to what is neutral, what is colored. To me epsilon geminorum appeared to have a very distinct cyan cast, much bluer than in the photos above. And at brief moments of better seeing I could detect a little of the Mars surface, which doesn't fare so well in the photographs (the star would look much sharper and smaller at moments, too). Otherwise the nine image sequence is very faithful to our visual impressions. As I look at them now it becomes a virtual time-machine back to that lovely evening's experience.